A series of flow tubes containing a triangular configuration of glass spheres and silicone balls. A set of sealed mineral cartridges embedded within or next to the flow tubes containing an aqueous crystalline solution of charged spring water infused with a wide array of minerals and most all the naturally occurring elements of the Periodic Table. Water is the life blood of the earth and all living things. Pure water can be defined as water in it’s natural, balanced state, both energetically and materially, yet, cleansed of matter and energy that isn’t congruent with nature. Water in its natural state has a complex structure which enables it to carry nutrients, both in physical and energetic states for the purpose of feeding, cleaning and protecting everything it mingles with. Water is present everywhere on earth and in the heavens, constantly sustaining, energizing and rejuvenating all life processes. On the contrary, unnatural water is created by water softeners, distillers and reverse osmosis systems which strip water of life sustaining minerals such as calcium and magnesium. Calcium and magnesium contribute to the yin and the yang of life processes. Calcium constricts the muscles and magnesium relaxes the muscles. Calcium and magnesium are two of the many important minerals dissolved by water as it seeps down into the earth. Water is one of the primary sources of these minerals for our bodies and for all life forms, yet our modern water treatment systems are removing them from the water. Why? Because they don’t understand how nature works. When water is brought back to it’s natural state, scale buildup is no longer a problem with pipes, nozzles and elements. Did you know that muscle is 1% protein molecules and 99% water molecules. Why does mainstream science study only protein molecules while neglecting the study of water molecules which constitutes 99% of muscle structure? A muscle builder can create a magnificent physique utilizing motion and energy. What is creating his perfect human structure? It’s water molecules! When these water molecules contained within the protein structure are subjected to correct motion and correct energy, they absorb the energy generated by correct motion and correct energy resulting in a bulking up and expansion of the water molecule, thus creating a structured physique. Modern water technologies also de-structure and de-energize water through the use of straight pipes which reflect unnatural motion and also chemicals which reflect unnatural energies. Just as the wrong kind of exercise and the wrong kind of foods can harm the body, the wrong kind of motions and energies can harm water. In both cases, what is being impacted and harmed is water, whether in the human body, a pipe, a river or a lake. Our Quad Flow structuring and energizing units are engineered to mimic the natural water cleansing and charging processes that occur within the hydrologic cycle. This functional motto of "comprehend nature and copy it" is based on the life work of water visionary, Viktor Schauberger, an Austrian forester and naturalist who lived during the first half of the twentieth century. The basic design of our water structuring units was inspired by implosion technology first developed by Mr. Schauberger based on his observations of water flowing in mountain streams. He realized that the energizing flow dynamics of water followed a three dimensional vortex pattern, a pattern that occurs at every stage of the hydrologic cycle. This three dimensional flow pattern called a vortex can be observed wherever water is found flowing in its natural environment. This natural flow is reflected by left and right turn spins, creating a tubular and implosive action resulting in a drawing in or collecting of waters from a wide periphery around the vortex culminating in a narrow flow of turbulent thrust. 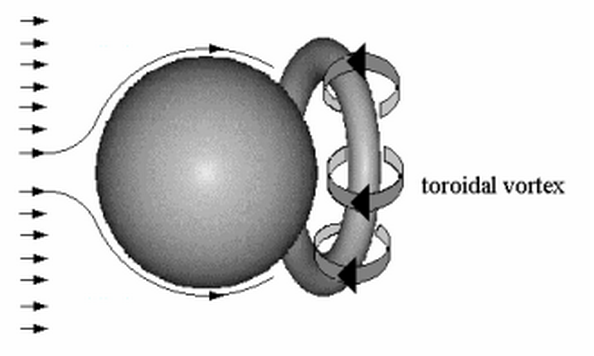 This dynamic toroidal vortex is the means by which energy flows and is the foundational basis for all life. The results of these vortex energy flow patterns can be observed in all natural conditions where fluids or vapors flow. A few examples of the actions and effects of the torus vortex are the electromagnetic fields generated by the human heart, the shape of flowers, fruits and trees. The vortex is the inspiration for all implosion technologies and the toroidal vortex in particular is considered to be the main mechanism responsible for imbuing water with its critical ecological functions of renewal and life support. Vortices are the energy transformers and energy accumulators in nature. A vortex can increase the vibrational state of any electromagnetic frequency and it can restore the natural energy patterns to something that has been corrupted. Vortex flow in nature and also mimicked in our water structuring units provides the ability to remediate all forms of pollution in water by transforming the electromagnetic frequencies of the water back to their healthy state. 2. The molecules of any given substance have a spectrum of electromagnetic frequencies that can be digitally recorded with a computer, then played back into untreated water (using an electronic transducer), causing the exposed water to behave as if the actual substance were physically present. What Dr. Benveniste's work proves is that it is not enough to simply remove toxins and contaminants from water via filtration, distillation, reverse osmosis or chemical treatment. To restore water to its healthy, life-giving state, the electromagnetic frequencies of any harmful substances must be removed or ameliorated and this can be accomplished using natures optimal tool, the vortex. Crystalline substances, whether liquid or solid, will absorb electromagnetic frequencies within their field of influence. Each of our units are intentionally charged with beneficial electromagnetic frequencies during every step of the manufacturing process. As water passes through the vortex chamber, its characteristics are transformed by the energy it absorbs. The water molecules interact with and exchange electromagnetic information and energy with the silica matrix thereby becoming electrically charged. Rotation of the water through the toroidal vortex not only structures the water, but also creates a bio-magnetic field which further enhances the potency of the life-giving elements, minerals and energy frequencies it contains. Ultimately, it’s the structure of water and not its composition that determines its properties. For instance, this can be observed with carbon, which according to its structure will form into a diamond, the world’s hardest material or into graphite, one of nature’s softest materials. What makes the difference? The angle of the molecular structure. The conclusion to be drawn from this example is that it’s not the properties that changes the characteristics of a material, it’s the structure. All our water structuring products through which water flows feature these principles. OUR FIRST INSTALL FOR THE QUAD FLOW HYDRO ENERGIZER RECEIVES A RAVE REVIEW!